The new Veloster targets entry-level performance enthusiasts. A new look for Hyundai’s sporty three-door coupe. The Hyundai Veloster is back and is ready for round two. After a six-year model run, Hyundai seemed to have called it quits with its quirky compact coupe, but following a one-year hiatus, an all-new model has emerged. 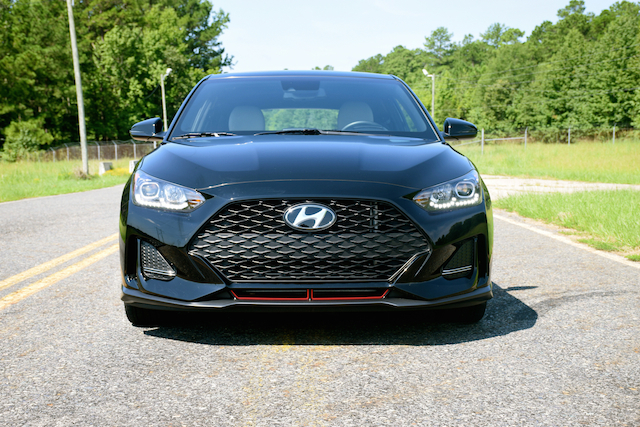 The 2019 Hyundai Veloster reflects an important overhaul for this coupe, but the dimensions are roughly the same as before. Some of the familiar attributes, including the three-door layout, are unchanged. Besides its new styling, the 2019 Veloster has a more powerful base engine and will see a late arriving performance “N” model join the model line. 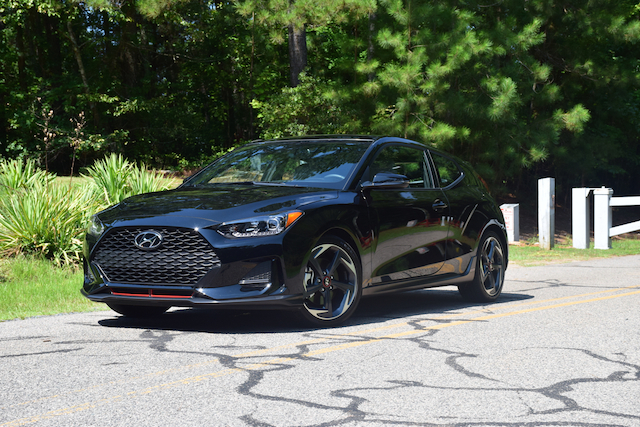 Hyundai supplied a 2019 Veloster Turbo Ultimate for my review. We’ll examine this model and I’ll share my driving impressions. But first, let’s take a look at how Hyundai is marketing the Veloster this year. You’ll want to know, because equipment and prices vary. The Hyundai Veloster is a coupe with three doors. Yes, you heard that right. On the driver’s side, is a normal (or large) door. On the passenger side are a pair of smaller doors. The rear door features a fully functional design with the handle placed in the rear pillar. It provides a sensible (and smart) way to access the second row, which is often problematic in traditional coupes. This model seats four. 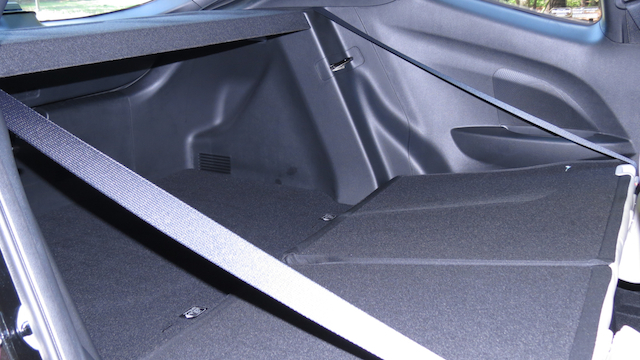 The rear storage compartment is deep and measures 19.9 cubic feet. That’s more space than any full-size sedan. Access to the storage area is by means of a liftgate. 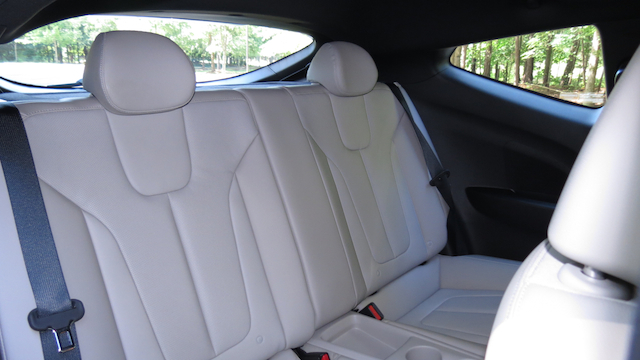 The rear seats also fold, extending that storage space considerably. You can begin your Veloster build by opting for the standard Veloster 2.0 model. Priced from $19,385, this one comes with a 2.0-liter four-cylinder engine, which makes 147 horsepower and 132 pound-feet of torque. This model comes with a six-speed manual gearbox. If you prefer the six-speed automatic, you’ll pay $1,000 for the upgrade. The standard features list for the Veloster 2.0 includes projector headlights with an automatic on/off function, LED daytime running lights, 17-inch alloy wheels and a rear spoiler. Inside, you’ll find power windows, power door locks, a tilt-and-telescopic steering wheel and air conditioning. Among the tech features the Veloster includes a six-speaker audio system and a 7-inch color display. 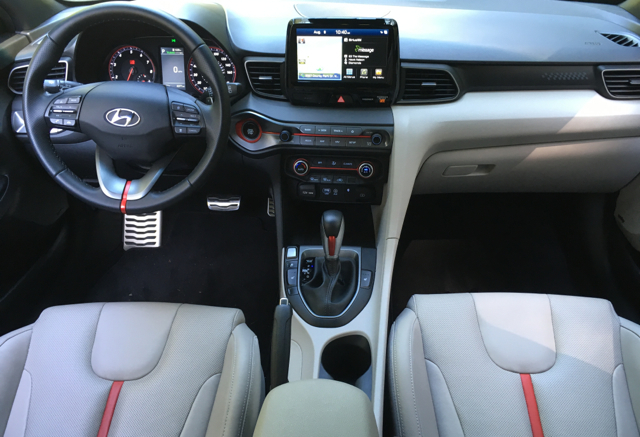 Hyundai also includes dual USB charging ports, an auxiliary input jack, and Apple CarPlay and Android Auto smartphone compatibility. A rearview camera is standard. Hyundai also supplies lane keep assist and forward collision avoidance. There are no packages available with this trim. As well equipped as the standard model is, the 2.0 Premium ratchets things up considerably. This one costs from $23,635 and includes the automatic transmission. At this trim level, you’ll find such premium features as 18-inch alloy wheels and a sunroof. The most significant improvements occur inside where an eight-speaker Infinity audio system is matched with an 8-inch display. Hyundai’s Blue Link connected car services are added as is satellite radio and a wireless charging pad. Paddle shifters, automatic temperature control and heated front seats are included. Again, there are no packages available with this trim. In the middle of the pack is the Turbo R-Spec model, which brings in the turbocharged 1.6-liter four-cylinder engine. 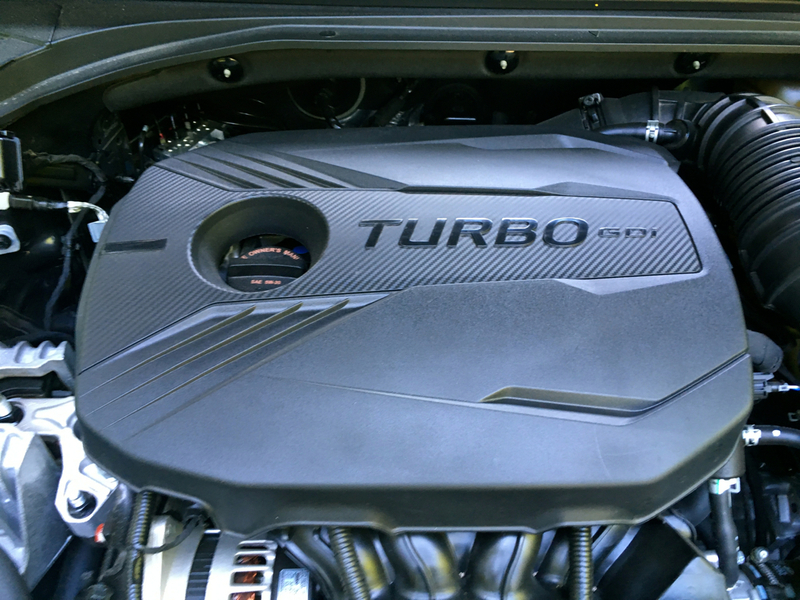 This engine makes 201 horsepower and 195 pound-feet of torque and works with a 6-speed automatic transmission. Hyundai prices this model from $23,785, which is just $150 more than the 2.0 Premium. The R-Spec adds such sporting features as a unique front grille and rear spoiler, summer performance tires and a unique sport-tuned suspension. You’ll also find dual-exhaust tips, a 4.2-inch color instrument cluster, special cloth seating and alloy pedals. The active engine sound feature pumps exhaust noise into the cabin. No packages are available with the Turbo R-Spec. The Veloster Turbo makes one crucial change. It replaces the six-speed manual in the R-Spec with a seven-speed dual-clutch transmission. Thus, the $26,285 starting price. This model also gains drive mode select, unique cloth/leather seats, power lumbar support for the driver’s seat and a perforated leather steering wheel. On the safety front, the Veloster Turbo gains blind-spot warning with rear cross-traffic collision warning. Once again, there are no packages available with this trim. My test model was the Turbo Ultimate, which costs $27,535. Add $1,500 for the DCT. This model adds a few important features, including a two-tone black roof and rain-sensing wipers. 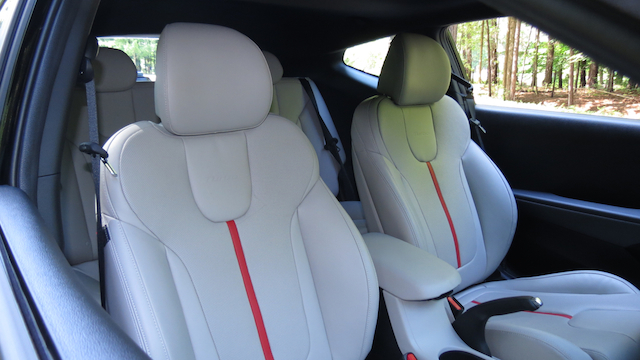 The seats are wrapped in leather and you’ll find several safety tech upgrades. These include: forward collision-avoidance assist with pedestrian detection, smart cruise control (DCT only) and a head-up display. There are no package upgrades with this trim, although you can make the case that the Ultimate is the package upgrade for the Turbo. Hyundai fans are excited about the upcoming Veloster N for two reasons. 1), A bona fide performance model comes to the Veloster line. It features a turbocharged 2.0-liter four-cylinder engine with 250 to 275 horsepower. That’s a fantastic amount of power for this little coupe. 2), This model will take on the likes of the Ford Focus ST and the Volkswagen GTI. Yes, the Focus will be gone from the market by the time the Veloster N arrives. Nevertheless, it’ll allow Hyundai to capture current Mazdaspeed and Mitsubishi Lancer owners as well as Ford fans who still want an affordable performance model. By the way, the “N” designation is for the company’s Namyang design studio in Korea. If it sounds a lot like “M” for BMW, that’s the intention. As for the remaining product information, we’ll have to wait until the N rolls out in the coming months. Slip behind the wheel of the Veloster and you’ll notice that the forward sight-lines are decent, but the rear sight-lines are limited. The sloping roof and large rear pillars make for a pair of huge blind spots on this vehicle. This is where you’ll rely much on the side mirrors as well as head turns to see around those spots. The front seats are quite supportive and they’re comfortable. No doubt, the leather-trimmed seats in my Veloster Turbo Ultimate are better than those in the base Veloster 2.0 model. They also have red piping, which also appears on the steering wheel and the center stack for a sporty expression. The metal pedals are handsome and feel solid to the touch. The ignition switch is located immediately to the right of the steering wheel, occupying the far left side of the center stack. The transmission shifter feels firm — you’ll want to place it in sport mode and work with the steering wheel-mounted paddle shifters from time to time. The paddles are one of the few disappointments I found in this model — they’re plastic and mounted to the wheel itself. My preference is for large titanium paddles connected to the column, which prevents crossing your arms as you make turns. The Veloster’s engine is not new to me. It is the same one found in the Elantra GT and is also used in other Hyundai products. It is also an ideal match for the lightweight Veloster. Activate the ignition and engage the transmission and you’re off. Even before the turbo spools, there is ample power at the ready. Press hard on the gas pedal and the turbo jumps in, delivering sufficient kick. The mode selector defaults to normal with sport and smart the other options. The latter mode controls the amount of digitally supplied exhaust noise delivered to the cabin. If you don’t like the drone you can turn it off through the control screen. Otherwise, the sport and smart modes control throttle response and steering effort. 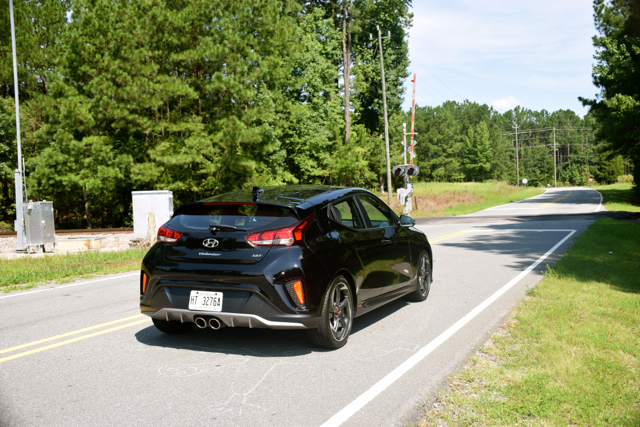 The Veloster Turbo excels on the twisty roads as it does on the straightaways. The sport-tuned chassis and low profile enable this coupe to hug curves with ease and it does a good job of pulling out of corners. Some torque steer is present, but it does nothing to take away from the driving feel. The steering is accurate and confidence building. 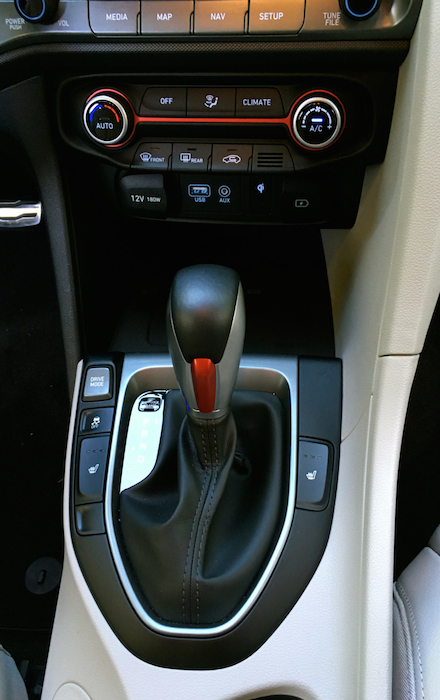 The dual-clutch transmission is great — it supplies quick and accurate shifts when you expect them. One feature not available with this model, but we think will find its way to the Veloster N is a limited-slip rear differential. But that’s where aftermarket customization comes in. For instance, Cusco and Quaife are two limited-slip differential suppliers of note whose product fits the Veloster. Our thinking is that the Veloster N will have one. Hyundai continues to keep the pedal to the metal with its small cars, even as Dodge and Ford retreat. They’re adding crossovers too, but its presence in the small car market is laudable. The all-new 2019 Toyota Corolla hatchback is a natural competitor as is the Honda Civic. But the Corolla doesn’t have a performance variant, at least not yet. We’d love to see all-wheel drive added to more small cars, giving the Subaru WRX a run for the money. As for the Veloster, it hits many of the right spots for shoppers of a small sporty model. 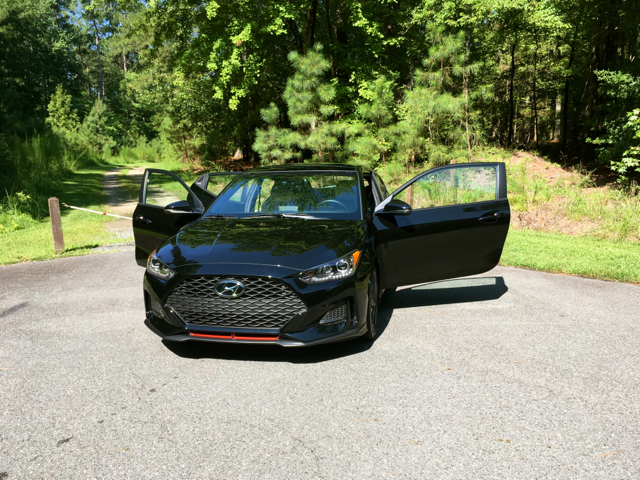 If the style and limited rearward visibility are personal show-stoppers, than the similar Elantra GT hatchback is a reasonable alternative and gives you an important reason to stay in the Hyundai fold.